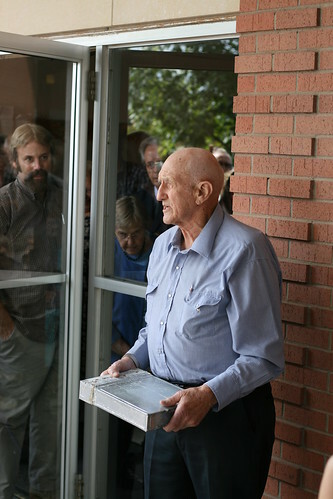 Rudy Schmidt died rather unexpectedly, but peacefully on Wednesday morning at his home…. One of the benefits of living in a small community is that I get to know people of all ages around here. Not just people my own age, or coworkers. A few years ago, I worked on a history project for our church’s centennial. Back in the 1960s, Rudy was one of the people in charge of building our current church. So he was a person I was interested in visiting with. 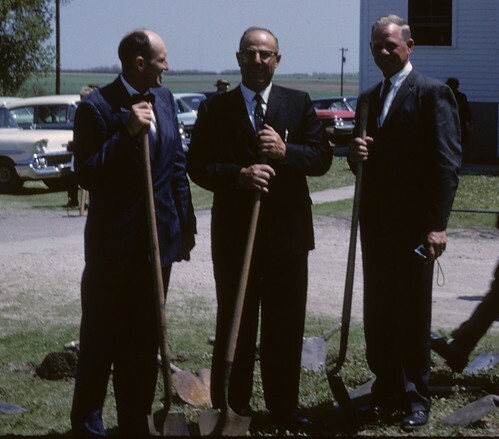 Here he is, on the left, during the 1964 groundbreaking ceremony for the new building (the old one is visible in the background). 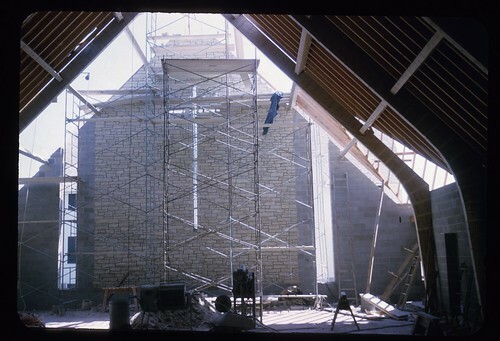 Back in 1965, there was a ceremony at the setting of the cornerstone of Tabor Church. The people at the time assembled some papers and memorabilia and put them in a time capsule. 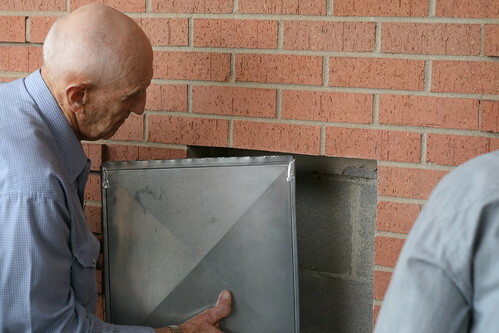 Rudy Schmidt sealed the capsule and it was placed in the spot for it behind the cornerstone. Here is a photo of that ceremony. 44 years later, on the occasion of Tabor’s centennial, it was time to open the time capsule. 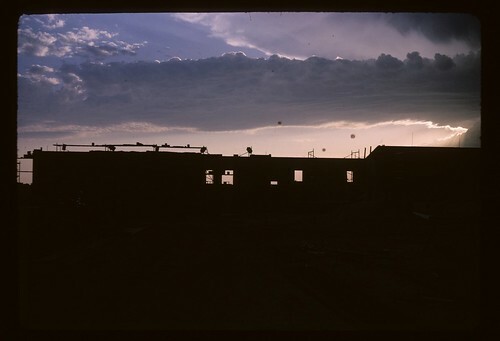 The other building committee people, such as Jake Koehn, had passed away, so Rudy was the one to open it. He gave a few words in front of the large crowd, and mentioned that when he sealed it away, he smelled some smoke when he soldered it shut. Jake Koehn told him, “Don’t worry, nobody will ever see it again anyway” and they had a little laugh about it. Now he was going to open it up and see if anything survived. It all did — just a few minor burn marks. We enjoyed looking at all the items. Then the church placed some new items into the capsule. It was closed up again, to be opened in maybe 50 years. With luck, I’ll still be around to see it opened again. Even if I’m not, maybe Jacob and Oliver will be able to. And so it seems very fitting that the last hands to touch that box for the next 50 years were Rudy Schmidt’s, when he placed it back in its spot on Oct. 12, 2008. When United Airlines recently broke some expensive guitars but refused to pay for their negligence, the owner of the guitars made a Youtube video. United corporate HQ noticed, and were so embarrassed that they fixed things. I’ve had some trouble with Dell breaking the law, and their corporate HQ noticed, were embarrassed, but didn’t bother fixing things. However, I have discovered something that Dell does care about: FEDERAL PROSECUTORS. Before continuing, I need to answer a FAQ: why I hate junk mail. It’s bad for the environment, takes time to process, and fills up my recycling bins. We only get our recycling picked up once a month (we’re lucky to get that where we live), and I hate filling them up with catalogs for things I’ll never use. Also junk mail has a way of multiplying like rabbits. Get on one list, and pretty soon you’re on dozens. Normally when I get junk mail, I’ll find the website or call the company that sent it to me and ask to be removed. And then they will stop sending me junk mail. It’s been a little while since I’ve written about this, so here’s the condensed version. Click the links for more details. Back in early 2007 — yes, more than 2 years ago — I had a lapse of judgement and tried to get a Dell monitor serviced under warranty. After a frustrating evening of trying to explain to them that I have a Dell monitor but not a Dell PC, they finally agreed to fix it. And put me on their “flamingo pink Inspiron catalog” mailing list. I went to their website trying to get off the list. They have many different list removal forms, and I tried them all. I called them. I even got a comment from Debbie at Dell HQ in Texas, offering to try to help. Despite repeated attempts, she didn’t (or couldn’t). So, in December of 2007, I decided to let Jacob rip apart my junk mail (with associated cute photos). By August 2008, I still wasn’t off their list. I tried everything, and Dell customer service replied to my request to be REMOVED from their snail mail list by saying they would ADD me to their email list. Lovely. 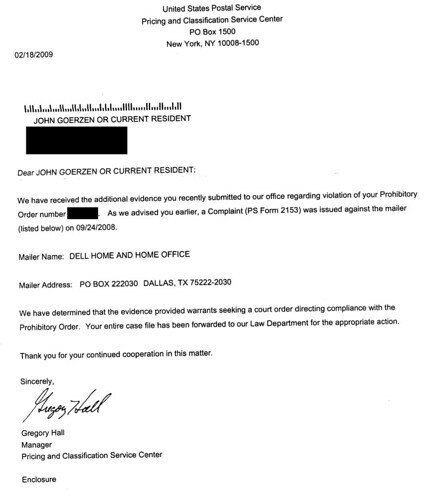 So I finally obtained a prohibitory order (see scanned copy on that link) in July 2008, which enforces federal law (39 USC 3008) prohibiting Dell from mailing me any more of those catalogs. From August 25, 2008 on, it was a federal offense for Dell to send me any more catalogs. Guess how successful that was. By September 2008, they were back at their old tricks, sending me catalogs. Yes, that’s right. The United States Postal Service went to court to obtain a court order against Dell, prohibiting them from sending me more catalogs. And — it was successful! It’s been several months since I’ve received any more catalogs from Dell. It took two years (it wouldn’t have had to, but I didn’t push things along very fast from my end, giving them lots of time to comply each step of the way), but I am finally free of Dell mailings. I suspect some federal attorneys in some remote office somewhere owe their jobs to Dell’s noncompliance of postal and privacy regulations. Now if only I can get Rep. Tiahrt to stop sending me junk mail… He keeps sending me literature, and I don’t even live in his district. It’s close! In the township where we live, Barack Obama defeated John McCain by 15 votes! I guess I should mention that the victory margin was 166 to 151. So it’s not like it was 15 votes out of millions. In all, 333 people in our township cast ballots, or about a third of the total population of our township. Just to give you a sense of scale, there are an average of 29 people per square mile out here. And the nutty jail expansion was defeated 3:1. Our county commissioners will just have to figure out some other way to house the county’s prison population (around six inmates) for awhile longer. What magazine to subscribe to? A few years ago, I — yes — subscribed to a paper magazine (US News). I didn’t continue my subscription because I stopped reading it. I stopped reading it because, frankly, there wasn’t that much worth reading a week after I heard it on NPR. I find I spend entirely too much time reading at a computer and far too little time reading elsewhere. I want to subscribe to a magazine that will actually be interesting. Thought-provoking. Challenging, even. Seems to have articles with a lot of depth, some interesting fiction in each issue. I guess I’d call it literary. I like what they have to say and the intelligence behind it. It seems I’ve got to love it for its use of diaeresis marks in print. The others I’m looking at include The Atlantic Monthly, The New Republic, and The Nation. Of these, The Nation perhaps looks the most interesting. But I’m leaning towards The New Yorker right now. You know you’ve got a bunch of Mennonites together when the pastor spontaneously asks the church to sing “Jesus Loves Me” while the children walk up for their children’s story. And, without music, everybody spontaneously breaks into beautiful 4-part harmony. It must be genetic or something. It was a day of beautiful singing of hymns a week ago for Tabor Mennonite Church’s centennial. It’s hard to write about that weekend, in fact — it was such a nice experience. Back in 1965, I was the one to solder this box shut. While I was doing this, all of a sudden I smelled burning from inside. I figured I must have caught something inside on fire. I asked Jake Koehn (another person on the building committee) what to do. Jake said, “Nobody will ever see it again, just put it in.” So let’s open it! I think Rudy has been wondering all these years whether he set it on fire or not. The box was opened, and other than a few scorch marks on an envelope, was completely intact and in good shape. 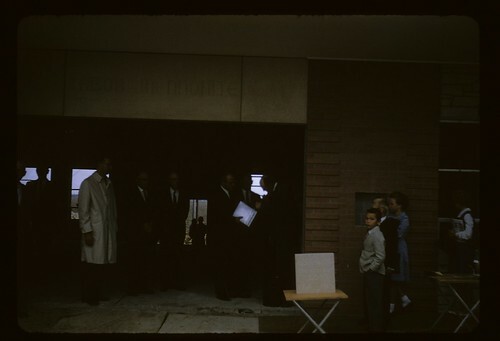 There was a copy of a local newspaper from 1965 with a headline about Goldwater, copies of programs of dedication for the new building and parsonage, a Bible, copies of the church constitution, and all sorts of other interesting things. To that we will add a copy of our centennial book (which I helped develop), CDs with recordings of our centennial activities, programs from the centennial celebration, and photos of the weekend. Earlier on Sunday, we had a long but good worship service with sermons from two former pastors. The choir sang, including a song commissioned for the occasion by Larry Nickel. We got applause after that one (which happens occasionally, but not regularly, in our church). All the living former pastors, and the widow of one of them, served communion as well. The service ended with the congregation singing the “Mennonite Anthem”. I think it was the most beautiful singing of that song I’ve ever heard. We had 352 people in church that day, and it seemed that not one person was going to let the moment go by without singing. Saturday had started off with outdoor activities in the church park. There was old-fashioned soap making, remembering how church members used to store fat all year, then get together to make soap for use in their homes and to donate to the needy. There was rope making, wool spinning, and rides for the children. Under the tent, we had some great music the local Greenhorns band, and the former pastors all shared some memories and stories about their time here. 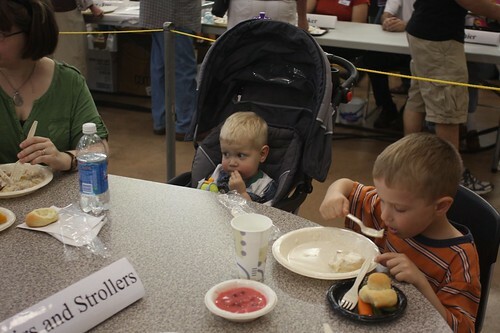 On Saturday evening, we had a meal and a drama — and managed to somehow fit 321 people into the church basement for the meal. We think that’s a record! The drama was written for the occasion by one of our members. John Gaeddert, a pastor here in the early 1970s, has become an expert wood carver in his spare time. He had carved a piece for us to celebrate the occasion, and presented it during the drama. That fit right in, because the drama was called “Bring Your Own Hedgepost” — back in the early days of the church, each member was supposed to do just that so they would have a place to tie their horses. Friday night was a lecture by James Juhnke about our first paster, P. H. Richert, who was pastor for nearly 40 years. Quite entertaining and interesting. I think the highlight of the weekend for me was getting to talk to some of the former pastors I never knew well. I had a few minutes to chat with John Gaeddert. I introduced myself, and he said, “Oh! I don’t think I’ve met you, but I’ve heard your name a few times this weekend. You’re on the centennial committee, right?” Yes indeed. I was born after he left this church, but he knew my grandparents — which means he also knows exactly where we live. John and his wife Mary are both such warm and friendly people that it feels like I’ve known them much longer than a few days! I got to chat with Jim Schrag too. He was pastor at Tabor until I was about 5 or 6. He didn’t remember me specifically, but he was also interesting to talk with. He was one of the people that worked on a detailed history book in 1983 for the church’s 75th anniversary. He told me that he processed most of the black and white photos for that book in a darkroom in his basement. I hadn’t known that — and mentioned I had found all those photos in the church archives and had scanned them all in. Jim requested a copy. Terah found Lenore Waltner, wife of former pastor James Waltner, who passed away about a year ago. James had started his career as a pastor at Tabor, and ended it at College Mennonite Church in Goshen, IN, where Terah grew up. So she knew him, but I didn’t. Terah introduced herself to Lenore, who seemed quite excited to make this sort of family connection! And Brenda Martin Hurst, another former pastor, found Terah and introduced herself. Terah said that Brenda said something like, “Hi, I’m Brenda, and I don’t think I know you!” These pastors all want to get to know everybody, I think!